New book, 96 pages, COM108. The Douglas A-3 Skywarrior, though something of a cult favourite, remains a largely unremarked classic of Naval Aviation. Built for nuclear weapon delivery, the A-3 made its name in Vietnam as a conventional bomber, tanker and Electronic Warfare platform. It was the largest aircraft ever regularly operated from the decks of aircraft carriers, earning it the fleet-wide nickname 'Whale'. It excelled in every mission area assigned to it and operated in the US Navy for more than four decades, from 1956 through to 1991. 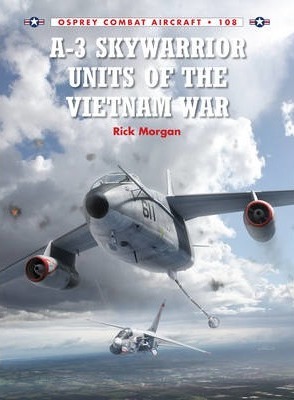 Fully illustrated to depict the incredible array of paint schemes and its awesome size, this volume focuses on the type's Vietnam service, which saw the aircraft briefly used as a bomber over both North and South Vietnam from March 1965, before the Skywarrior proved far more valuable as a multi-role tanker (KA-3B) and tanker/tactical jammer (EKA-3B). The title includes details on all of these operations as well as more clandestine reconnaissance missions, and provides information about the men that flew them.